In recent days, the City of Elk Grove has started conducting another survey. Unlike the survey recently completed that was open to everyone regarding the naming of the Elk Grove Civic Center, this questionnaire appears to be done using a somewhat more scientific method. The survey which is being conducted online is asking selected participants a host of questions on the city council's long-sought sales tax increase. The entire survey can be viewed below. In the introduction to the survey, respondents are presented with what can be best described as the proposed title of the tax initiative that may be presented to voters in November - the City of Elk Grove Quality of Life and Essential Services Measure. The manner the survey questions are presented raises many issues, not the least of which is why the tax increase is needed? With real estate values increasing after the declines during the Great Recession, increased Mello Roos fees, growing sales taxes revenues, especially at the Elk Grove Auto Mall, higher funding for road maintenance from the new state gasoline sales tax, and continued building of housing units surely have added to the stream of cash flowing into city hall. Furthermore, for anyone who has watched the city's budget process for any length of time will undoubtedly be aware of the praise the Elk Grove City Council has regularly lavished on city manager Laura Gill and her staff for her financial prudence. Were these just empty words that are masking severe financial trouble, gross mismanagement, and inadequate oversight on the part of the city council? Or perhaps Mayor Steve Ly and his city council colleagues have realized that the annual road maintenance that they have neglected to act on to the tune of tens-of-millions-of-dollars needs to be dealt with and talk of other goodies is merely a bait and switch maneuver. In the coming months, deliberation on the City of Elk Grove Quality of Life and Essential Services Measure be heard at the city council meetings and will undoubtedly be a topic of discussion in the city. As this issue progresses, we will cover many different aspects of this developing issue. If you did not receive this survey and want your opinion heard, you can print it out (click here for printable version), complete it and mail it to The Elk Grove City Council, Elk Grove City Hall, 8401 Laguna Palms Way, Elk Grove, CA 95758. 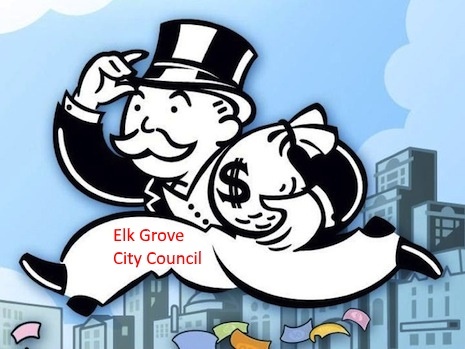 Although it may be a relatively small fraction, lets not forget that about 7 years ago the Elk Grove City Council lowered developer fees. For this they were recognized my the smiling assassin, Mr. Joshua Wood of Region Business [Region Builders as they were then known]. cordially discuss policy items affecting the local development community'. So if we are needing to increase sales taxes to make-up for a shortage, which may or may not be the case, we will have to see, it would appear this additional sales tax revenue could be making up for lost revenues from lower fees for developers. Put another way, the city council is placing a heavier burden on residents via a regressive tax so that developers can fatten their margins. I support the .5-1% sales tax because I want essential services and quality of life. I want our sales tax raised to 8.25-8.75%, because I want the essential services and quality of life that those other cities don't have! Yes, D.J., with all the hype coming from the dais by Elk Grove City Council members, you would think that Elk Grove is already head and shoulders above all of the other cities in the region. For example, we just got upgraded to the same garage services Rancho Cordova receives -- and were paying more than Rancho for lesser services. Just recently, the Elk Grove City Council approved another increase. And who fault is that? We only have to look at the gang of five who approved the no-bid contract in one hand and take contributions from Republic Services in the other. I trust our Council as money managers and will support the sales tax increase. The Council track record of managing our money is impeccable. We have a bathroom in Old Town now to help support Food Truck Mania. Plus, We have a 100 acre parcel outside the city limits that brings in revenue from hay sales. Cashing in on commodities is like Wall Street you know! Plus, that $450,000 lost on a waterpark feasibility study will be easily recouped when we charge Junior a buck or two to swim in the pool this summer. And when Fido runs away from home, he has a nice shelter he can hide out in for a week or two. Come on, we need more essential services and our potholes filled. Plus when that ACE train station gets built, there might be a reunion concert at Altamont someday!